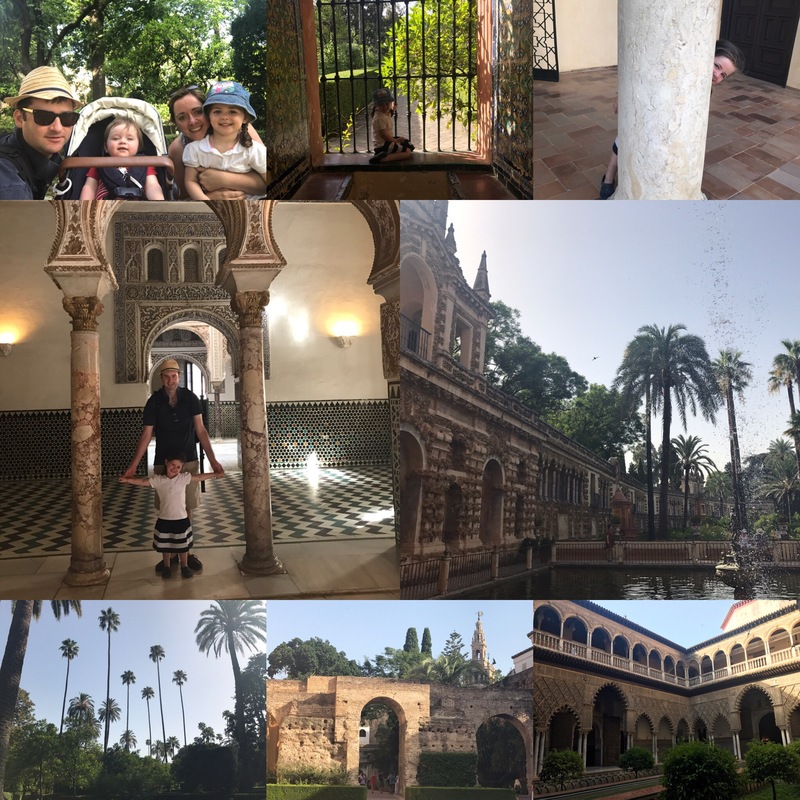 We’ve just returned from the most amazing fortnight in Andalusia – doing the golden triangle – Seville, Cordoba and Granada. Yet again we settled on an Airbnb (they really are the only way to attempt a city break with children in tow! )- choosing a 2 bedroom apartment in the heart of the old town. The main draw to the apartment was the roof top swimming pool and the air-conditioning. With temperatures predicted to be scorching (Seville is known as the frying pan of Europe!) we needed to do everything we could to make it manageable for the children (and my husband!). Parking was a 5 min walk away and was easy enough (once we’d managed to negotiate the stupidly narrow roads in our particularly wide hire car!). 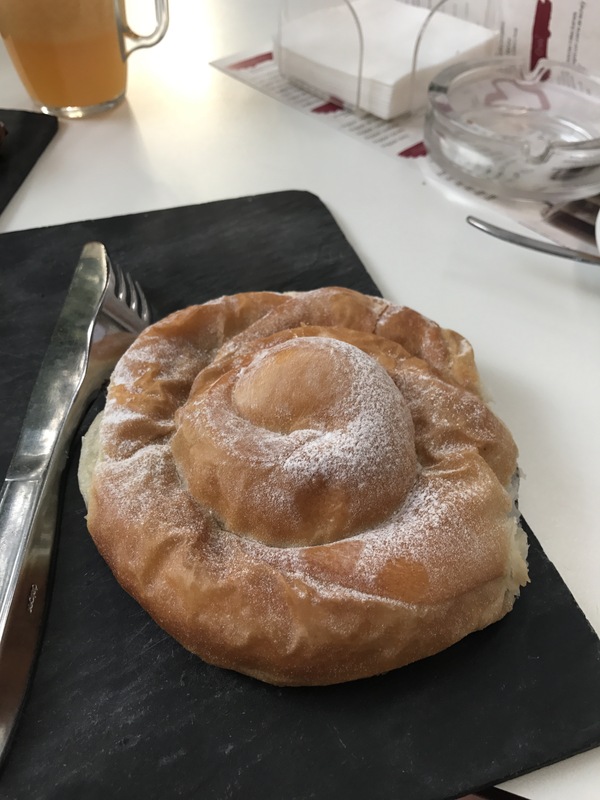 The apartment was well located – it was an easy 15 minute stroll from the main sites and there were a number of great bakeries, supermarkets and restaurants in the area. 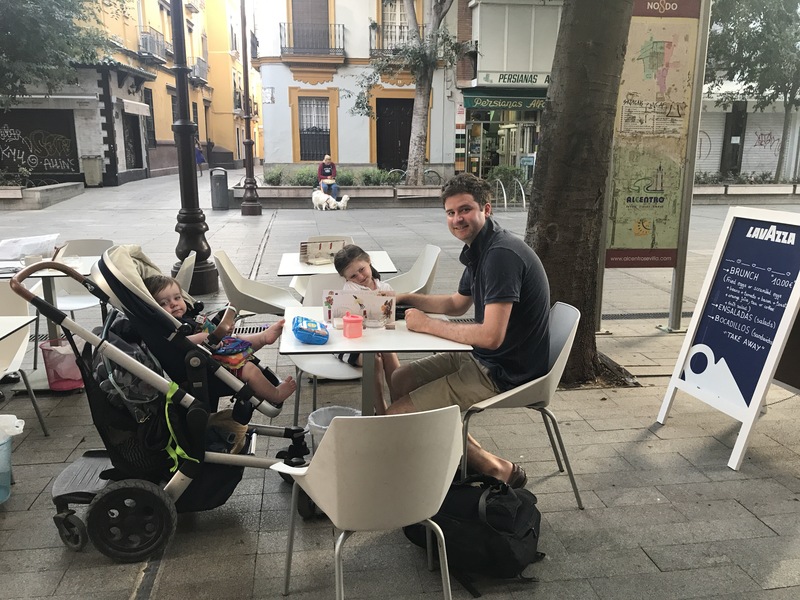 With temperatures soaring and regularly hitting somewhere between 43-48degrees we decided to front load our sightseeing – starting with breakfast at a wonderful little cafe around the corner from the apartment. Pan y Piu had plenty of seating (including high chairs) and an incredible selection of croissants and pastries as well as yummy fresh bread (this was not the time to start a diet!). You could also come here for a light lunch and the odd vino later in the day. The bakery opened at 8.30 so was ideal for our early risers! Having eaten our body weight in croissant we walked through the old town, admiring the beautiful buildings and soaking up the hustle and bustle of a city starting to wake. We set out for Seville’s immense cathedral, one of the largest Christian churches in the world. We didn’t venture inside but sat in the square admiring the building with its amazing mix of architectural styles – with minarets and gothic embellishments going hand in hand. After a brief pause (and a much needed drink of water!) we set out for the Plaza de España – a huge half-circle with buildings continually running around the edge accessible over the moat by numerous bridges and many tiled alcoves, each representing a different province of Spain. We wiled away 40 mins or so looking at the incredible tiles and sitting in the shady alcoves. * you can also hire a boat on the lake in front of the plaza. The plaza is located within the Maria Luisa Park. The park is decorated with numerous monuments, fountains, ponds, gorgeous beds of flowers, ceramic-tiled benches, and impressive Art Deco and Mudejar buildings. It also houses two of the city’s main museums – the Archaeological Museum and the Museum of Popular Arts and Traditions. A stroll through the park and some time in the play area is a must see attraction if travelling with children (and provides a welcome break from the summer sun!). You can also take a horse and carriage ride around the park but I have to say we didn’t fancy this in the heat! Although we tend to carry a cool bag and ice packs (thereby saving ourselves a fortune on water!) there were lots of lovely cafes in and around the park and plaza. So we’d managed to tick off some key landmarks and all before 11.30am. It was now feeling pretty warm so we began heading back to the apartment for lunch and siestas. 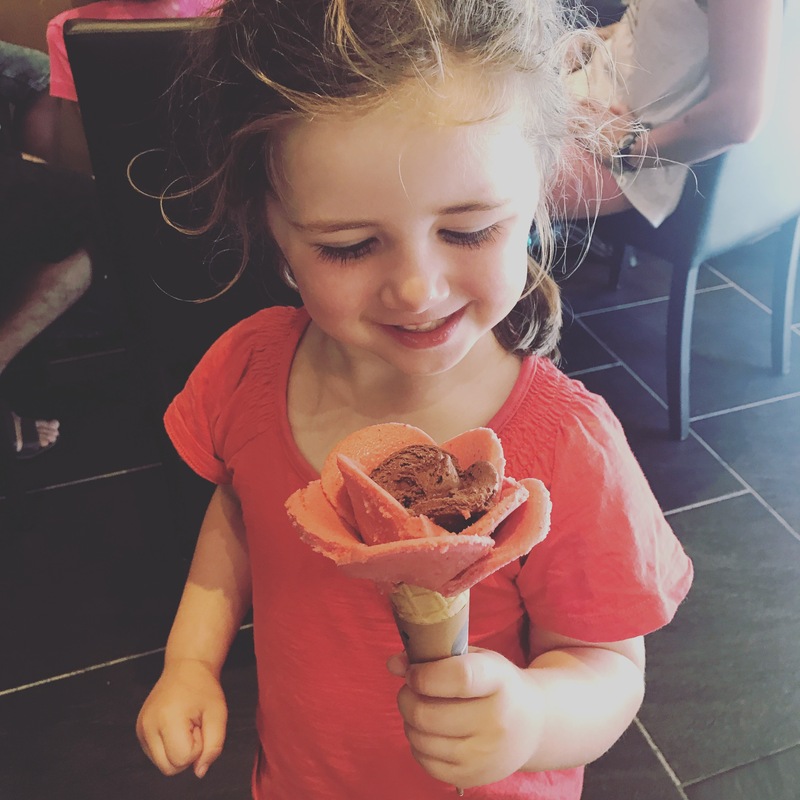 At 3pm ish with both children rested we ventured back out and went to Amorino for an icecream – not any ice cream – their signature flower ice cream is sensational and one of the travel memories that will stay with us for ever! Amorino may be a chain, but it’s a good one! Dinner was had back at the apartment…I love cooking using local ingredients and thankfully, having spent in excess of 10 years holidaying, as a child, in Barcelona and on the Costa Brava I am reasonably familiar with local ingredients and able to knock up some traditional (ish) dishes. With the children settled in bed my husband and I ended our first day with a bottle of cava….bliss. So front loading our sightseeing had worked yesterday so again we ventured out for breakfast. This time (by some sort of miracle!) we were out just after 8am so we needed to find another breakfast spot. Luckily we stumbled across love horno artisano on Placa Alfalfa – translates as artisan oven! – its seriously worth a visit. 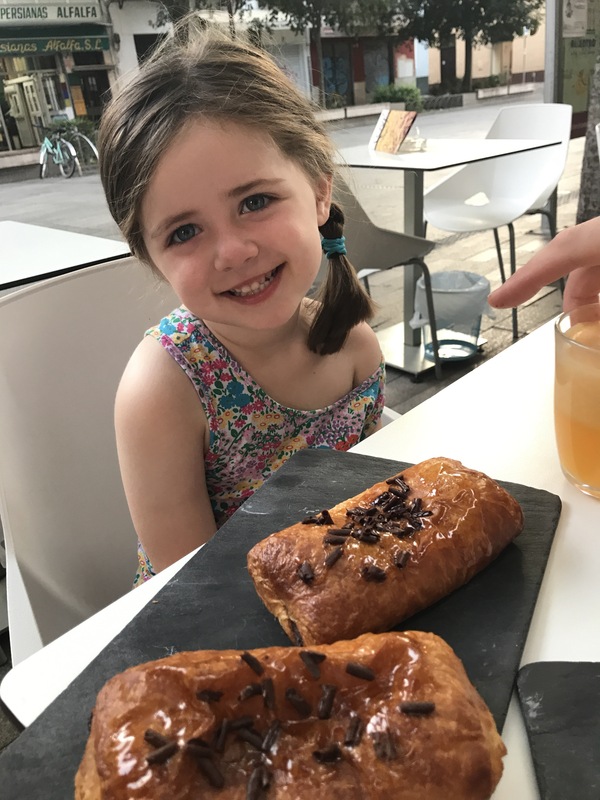 The croissants were divine (you must try the chocolate ensaimada and the fresh orange juice) and we could sit out in the placa watching the world go by. I noticed there were plenty of gluten free/lactose free options as well. On the agenda for this morning was a trip to the Real Alcazar – a royal palace that is regarded as one of the most outstanding examples of mudéjar architecture on the Iberian Peninsula. We booked before arriving (it was easy enough on their website) choosing to visit at 9.30am. This, in hindsight, was a wise move. The queues for on-the-day tickets was already pretty long by the time we arrived (not good when you have little people in tow and need to get your sight seeing done before it gets hot!). The gardens were the main hit for our two children – they enjoyed exploring, jumping in the fountains and admiring the gorgeous flowers. We easily spent two hours drifting around here (including a well earnt drink in the garden cafe!). Back to the apartment for lunch and a snooze. At 3pm we ventured out, this time to Aquapolis, a water park 20 mins from the centre of the city. We booked our tickets online before we went and there was no need to print them beforehand. Parking was really straight forward and a simple 2 minute walk from the main entrance. As we were arriving in the afternoon, and figuring it would be busy, we opted to pay a few euros extra for the reserved parasol area. It was perfect…loads of space between sun beds and plenty of shade. The swimming pools were incredible (although to protect children photographs are not permitted!). There was a huge area dedicated to young children and plenty of supervision from life guards. 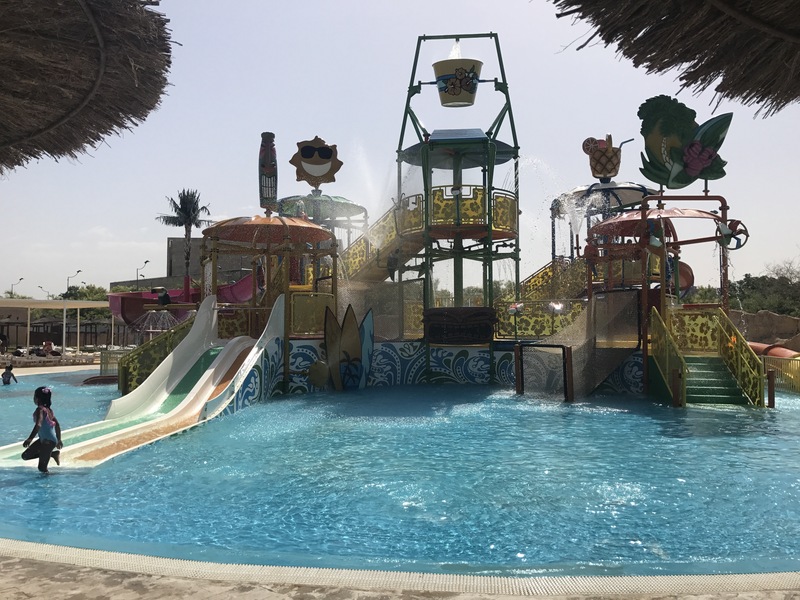 Adults and younger siblings were free to sit in the water around the slides. We had a truly wonderful family afternoon. One of the holiday highlights. Today we were moving on to Córdoba. After breakfast we packed up and ventured to Isla Magica to use some complimentary tickets we’d been given. It was awful. Don’t bother! Parking was expensive and a good 10 minute walk from the park entrance (in 48 degree heat this was not much fun!). It’s then another long walk to the water park area. Whilst the toddler area was amazing the sun loungers were crammed in and the grass was muddy and un-usable. The life guards were zealous in their upholding of pointless and petty rules (things like adults and younger siblings not being allowed to sit on the edge of the pool and toddlers having to come down slides on all fours). We had enough after an hour. We left and we’d certainly never return. Overall, a great start to our two week road trip around Andalucia. 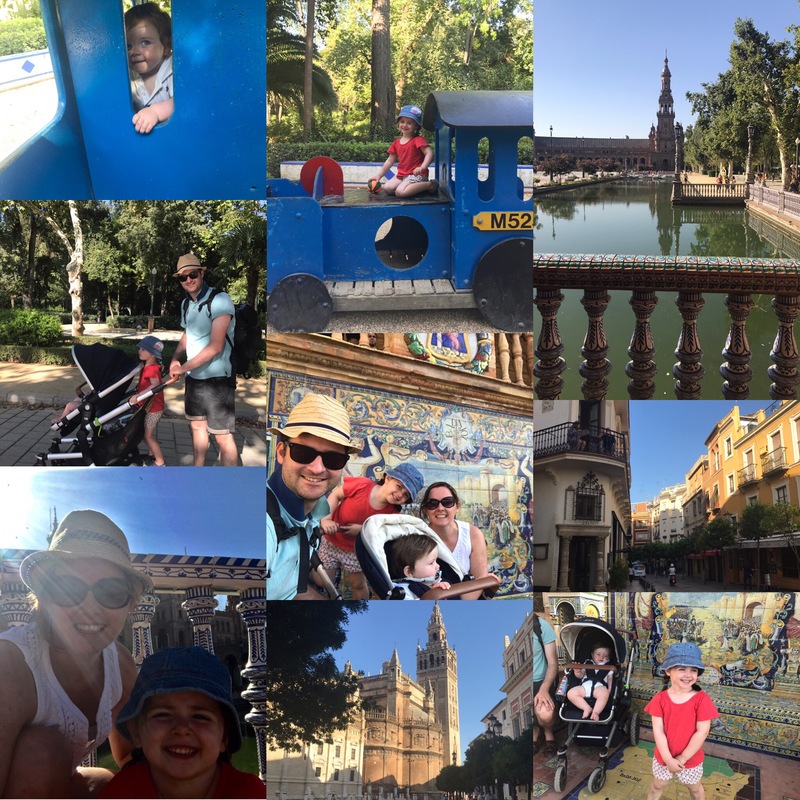 I highly recommend Seville – perfect for a stand alone city break (and we only touched the surface of what was on offer – the Kids and Compass blog on Seville has some other great ideas!) or as part of a trip around Spain’s golden triangle.